Many of us in the eastern United States are cleaning up after Hurricane/Tropical Storm Irene swept through the area. Shelter was without power until Thursday, but many others are dealing with far greater damage. Our neighbors in Vermont were hit hard by the storm. We hope things are soon returned to normal. After a big storm, we see a lot of customers coming in to Shelter looking for good saws for cutting fallen trees and limbs. We carry a great selection of saws to get the job done. In particular, our selection of Japanese hand saws are perfect for cutting large and small limbs. The Silky Sugoi 360 Saw is one of our favorites. It offers an aggressive cross-cut tooth pattern (5.5 teeth per inch). The precision-ground, razor-sharp teeth with four cutting angles provide extremely fast, clean, and smooth cutting action. Features include a hard chrome-plated, taper-ground curved blade with a non-set tooth design and a starter knife at the tip of the blade. The curved blade provides greater cutting speed with less effort. The large and comfortable sure-grip handle gives strength and flexibility to the full length of the saw. 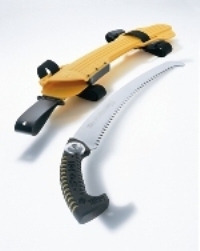 It also comes with a scabbard that can be attached to a belt or leg, and (as with most of our Japanese hand saws) the blade is easily replaceable. Shop for more saws on our website or read more about Japanese hand saws on Shelter Blog. What do you do if you have a lot of fallen trees on your property? The New York Times "Bucks" blog posted a helpful Q&A about the insurance implications of fallen trees. 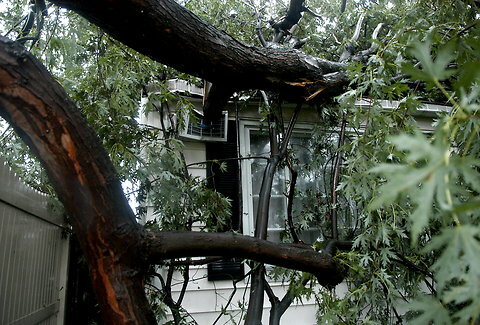 Q: Does insurance cover the cost of fallen tree removal, if it does not hit your home? A. Generally, no. Homeowners insurance covers damage to insured structures, like your house or a detached garage. You’re also covered for resulting damage to any contents, and the cost of removing the tree if it falls on either structure. But, “If it just makes a mess in your backyard, it’s generally not covered,” says Jeanne Salvatore, a spokeswoman for the Institute. Some of you may have a large tree or many fallen trees on your property, and a power tool is necessary to clear the area. Here are a few key chainsaw tips from Pat Hennin to ensure that your engine purrs smoothly every time you haul on that pull-cord. buy a chainsaw with a short bar—you're less likely to cut off your feet; an 18-inch blade will easily cut a 36-inch log. Pat Hennin started using a chainsaw in earnest around 1960 when he worked as a lumberjack in Idaho. He had a plot with selected trees for felling in the Targhee National Forest and spent three solid months working those woods. If you have chainsaw questions, are looking for backwoods tools, or need a new chainsaw, call or visit Shelter, and we'll help you find find the right tool. Storms and tornadoes are getting stronger it seems that having fallen trees is a common thing. Your tips regarding insurance is a good idea. Forces of nature will always be upon us and trees are significant for this world in spite of accidents it can be associated with, it is always better to plan where to plant trees or where to build a home to avoid such incidents. After certain seasons or weather disturbances, it is not surprising to have fallen trees or tree branches in the yard or near the house. Lawn maintenance is an important part of having greenery around you. It sure is significant especially for the safety of the inhabitants to follow such tips to avoid accidents as we cannot control wind, rain or snow and other natural happenings.